Summer can bring extreme heat to certain areas in the U.S. Our new online store gives you real-time product availability that helps you get your order fast. Need misting fans, evaporative coolers or misting systems right away? We at Advanced Misting Systems have them on the shelf. Need easy ordering options? We provide that! We are now accessible on your mobile phone and tablets on our new updated website. We now monitor our phones 24-hours a day and even on the weekend to better serve you. We have over 21 years’ experience in the outdoor cooling industry. Many use our mist cooling products for dust and odor control or humidification. Others use our misting kits for fog effect systems. Our experienced staff can help walk you through any project you may have from a small patio to the largest jobs. 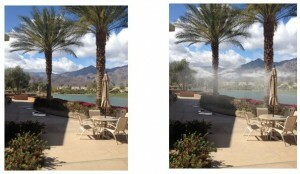 We can also assist you in creating a custom misting system that is hidden to cool you without the bulky look. One of our high-profile customers is Tony Robbins. He and his wife loved to sit outside their desert home and soak up some sun, but it would get too hot during the summer. After they reached out to us, we were able to help them build a custom mist system that blows mist from rocks, tiki man carvings, and palm trees. They get all the benefits of a cooling mist without seeing where it was really coming from. Another recent elite customer was Chevron Company. They wanted us to come up with a way to cool gas production pipes that would heat up during summer. Without being able to cool them down, they would have to slow down production when the pipes would overheat. This project was large in size with many safety factors involved. After developing a complex system, we were able to achieve a 27-degree drop in temperature for summer operations. There is absolutely no job too big or small that we cannot come up with a cooling solution for your particular needs. Get in touch with our team today online or by phone: 760.779.1352.